"The new way – it isn't so new anymore." In fact, Nu-Way Kitchens Inc is the oldest cabinet shop in the region. Nu-Way Kitchens was founded in 1964 by Clarence Wolters. He had a vision of a new method for making custom, built-in cabinets. At the time, the standard way to produce kitchen cabinets was to have a finishing carpenter build the cabinets on-site. Cabinets were built directly onto the wall, essentially becoming permanently affixed to the structure of the building. The quality and style of the cabinets was dependant on the abilities of the builder's finishing carpenter. Clarence's bold new concept was to build the cabinets in a shop and transport them for installation. Though this seems to be basic common sense nowadays, at the time it seemed revolutionary. This method has become the universal standard for custom cabinetmaking. It immediately resulted in a general improvement in quality. Options were added, starting with the pull-out bread board, then the Lazy Susan. Now, the options available are almost limitless. Clarence adapted the skills learned from working in his father's furniture shop in Holland to producing custom, built-in cabinets. Now retired, he has handed the family business to his sons, who have always 'lived and breathed' cabinets. Nu-Way Kitchens continues to operate as a family business, providing a completely custom cabinet experience in a way that a family run enterprise is so well suited for. Now, all these many years later, you could say that the new way has become a tradition. Nu-Way Kitchens – Quality. Function. Design. 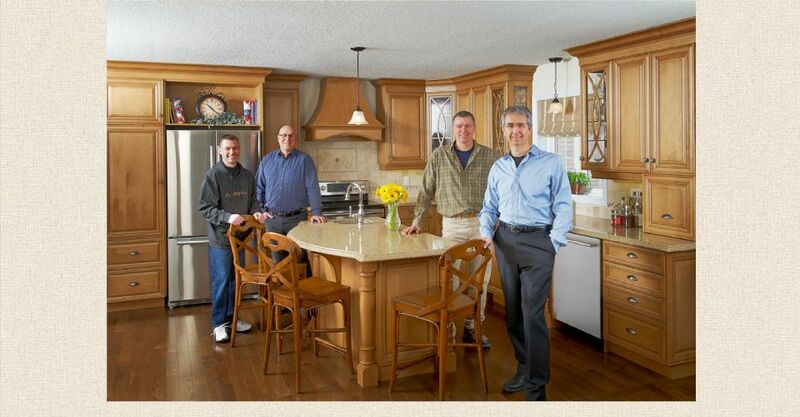 Nu-Way Kitchens is part of the Canadian Kitchen Cabinet Association.